As schools innovate and transform what teaching and learning look like on their campuses, the design of academic buildings is likely to change in dramatic ways as well. Classrooms and lecture halls may, over time, fade away and become relics of our educational past. Bryant University, a private university located in Smithfield, Rhode Island with academic programs that integrate business and the arts and sciences with a global perspective, offers a glimpse of what the future of campus design could look like. Its new Academic Innovation Center (AIC) opened just this past fall. The Center provides spaces for innovative and interdisciplinary teaching and learning where students can learn in novel formats, develop and prototype new products and services through a design-thinking approach, and collaborate. The goal is to bolster students’ capacity for innovation and creativity. To facilitate these interactions, Bryant created a building that was recently awarded College Planning & Management’s grand prize for design and architecture. A 48,000 square foot building that cost $31 million to build—$1 million under budget—the Center emerged through a thoughtful collaboration between Bryant University and the architect, Kip Ellis of EYP Architecture and Engineering. What follows is an interview with Ron Machtley, president of Bryant University, and Ellis. It has been edited for length. What were your goals in creating the Center, Ron, and how did Kip help your team understand their full implications for the Center’s design? What was that working relationship like and how was it structured? Ron: The goal of creating an academic innovation center was to establish a dedicated space where faculty could develop innovative teaching practices. It was to be a space that had writable whiteboard surfaces available for students to break into groups and brainstorm concepts, integrated technology, and moveable furniture. We wanted a space that would be a place of collaboration between students and faculty, as well as a place for faculty to present material in ways other than strictly lecture format or lecture with integrated PowerPoint. Because we had two previous prototype rooms, we had a good understanding of how we would create flat classrooms, and what kind of materials to use on the boards and the walls. What type of space and even what type of furniture—how much, how wide, how long, how heavy. Where to put the computer screen, how to deal with the podium. (A great deal of time was spent discussing podiums.) However, we had no significant experience with what we now call tiered classrooms or the historic business case study classrooms. We wanted this building to be used by our faculty in both arts and sciences and business. So we needed to visit many different locations to see how tiered classroom space was built and utilized and see how flat classrooms were used. We had many people going on tours around the country—Stanford, Harvard, MIT, and many other colleges. What we saw was that there were many developed classrooms but never an entire building. What made our academic facility unique was the innovation forum. It is a place where, when faculty want to break the class up into groups but want the students outside the classroom, they have a space that can accommodate 100 people working in small groups or all together. This was rather innovative. Most buildings are merely looking at the classroom space and when a classroom wants to break into groups, there isn’t another space nearby. Sufficient space might be in the hallways. We wanted to make sure we had ample space for students to work in groups. If this was going to encourage collaboration within the classrooms then it seemed there would need to be numerous breakout rooms where students could work in groups during the evening and even during the day. We had had some experience and we wanted this building to be open, light, transparent—much like the loft spaces that many of the startup companies in Silicon Valley and San Francisco were using. We went to those areas as well. You see some of those characteristics in this building, with the wooden floor and the glass and the openness, which is atypical of most classroom buildings. Perhaps of paramount importance in this design was the involvement of faculty with our architect. Faculty had spent almost four years prototyping a flat classroom and thinking about how to present their material, so, when we began to discuss what the classrooms would look like, there were experienced faculty to discuss their strengths and weaknesses with existing and proposed prototype classrooms. Kip Ellis had a great architectural team and we also had done a great deal of analysis of how many classrooms and what type of classrooms should we have. Kip, you have designed a lot of buildings on college campuses. What was different about this project compared to other college buildings on which you have worked? Why would a college building with standard classrooms and lecture halls not suffice? How did you think through the design given what Ron and his team communicated to you? Kip: The concept is unique. Unlike traditional academic buildings that focus on accommodating the needs of only one or a few specific programs or departments, the Academic Innovation Center is a dynamic, revolutionary and new way of providing flexible spaces not only for instruction, but most importantly, to host groups of students working outside of scheduled class times. The idea of different types of courses, with a variety of learning modalities, creates interest not only among students, but for Bryant’s faculty as well. By creating the “place to be”, the level of excitement and spontaneous creativity runs high and promotes a real awareness of the importance of engagement. And, frankly, the energy is contagious. 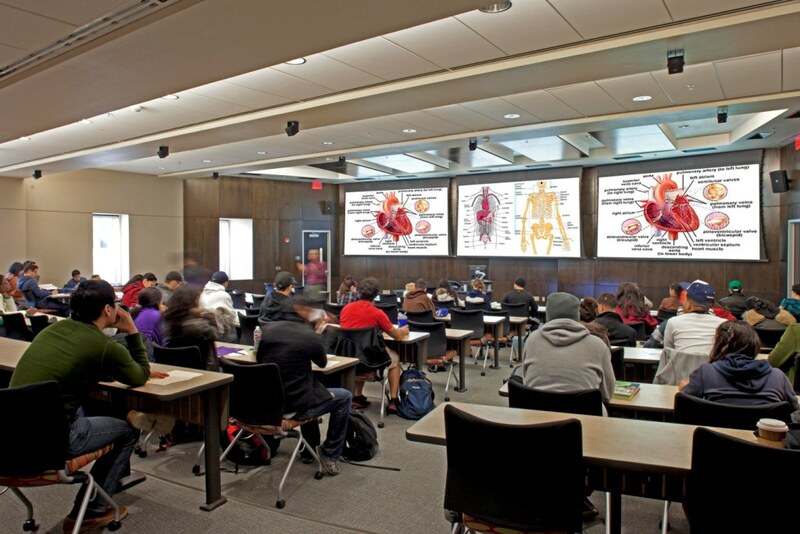 The typical traditional classroom and lecture hall spaces typically found in academic buildings would never have provided the environment needed for experimentation, evolution and synthesis of new ideas and approaches. By creating a luminous, transparent and comfortable physical environment, filled with artwork and very inviting, collaboration and engagement manifests itself throughout the building. What happened along the way toward completion was a progressive and vigorous interaction that took into consideration both limits found in existing academic spaces, consideration for what was working well in earlier prototype facilities, and the magic of orientating the spaces of the building around the central “Innovation Forum.” We worked to make the process of design as active, engaged and innovative as the building we were charged to design was meant to be. It’s inspiring to walk into the Center. Sunlight streams in, and the flexible spaces scream innovation. Students are buzzing around and working together in every nook and cranny. I imagine it’s a delicate balance though to create spaces that are flexible enough to support different teaching configurations, but not too flexible that they lose any sense of purpose and continuity. How did you both think about this challenge? Ron: This was a challenge indeed to deviate from a typical classroom building of classes behind solid doors, with little transparency without sunlight and the openness of the space. We wanted to have a transparent facility, just like lofts in California, where students would get the feeling that they are being watched as well as being part of other activities. We also included the food court, and we have the innovation forum. Students are used to this kind of open environment, so we developed it with that specifically in mind. Kip: Fortunately, Bryant had already been experimenting with non-traditional, flat-floor, team-based learning environments with the Bryant IDEA and the Ideation Lab, so there was great interest in creating larger and more flexible spaces that couldn’t be created within existing buildings. The EYP Design Team quickly familiarized itself with what Bryant had tried, and brought our experience in designing multi-modal learning spaces to the visioning of the new building. You both embarked on a very collaborative process as you designed this building that not only resulted in an innovative building for an innovative academic program, but also came in under budget. What advice do you have for other university administrators as they work with architects to design novel spaces to support teaching and learning in the 21st century? Ron: Having completed, now, almost 400,000 square feet of buildings, the most important advice I could give to anyone, any president or organization who is about to build a building, is to make sure you have a good architectural firm that can provide completed drawings and you spend a lot of time up front reviewing the conceptual drawings before they get into completed finished drawings for bidding. And that you really have, with the team collectively, all the details for these drawings. It is the change orders after the drawings that put projects behind schedule and cost a great deal of money. If you can have almost no change orders, which is where we ended in this project, the result will be a much better building built to budget and as important on time. We finished this building of almost 50,000 sq. feet in 14 months and for $31 million, almost $1.5 million below our original fall drawing budget. How do you both think this building will influence building design on other college campuses and postsecondary institutions going forward? Ron: I think it is perhaps one of the first attempts at consolidating all of the types of innovative classrooms, technologies, space, and natural light, in one facility. Many campuses have an innovative flat classroom or tiered class space but we never found a campus that had a single building of multiple innovative spaces teaching courses in more than one school or discipline. And I think it will be modified, improved. And people will learn from our experience; we hope this is a prototype for many other universities as they go forward. Many universities have flat classrooms. Many universities have tiered classrooms. But few have developed an existing full building which accommodates all of these concepts. Kip: We believe the AIC will serve as a living laboratory that encourages and promotes new ideas, and also challenges familiar approaches and helps prepare leadership through and active, participatory educational journey. This journey is likely to promote a continuous and evolutionary development of courses and the way that students engagement is fostered and mentored. The possibilities are impossible to predict, but one imagines visitors will be curious to learn more about what is working and will likely emulate those successes in their own projects. That’s the exciting thing about design; the balance between historic precedent and the spontaneity of invention. It will be interesting to see how the AIC inspires others to invent new solutions for new challenges.